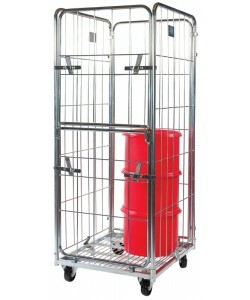 Roll cages, or roll containers as they are commonly known, are ideal for handling large amounts of goods, products and stock. Ideal for industrial use, within warehousing, factories, transport and distribution our selection of roll containers are available in nestable and demountable formats to help save on huge amounts of storage space. 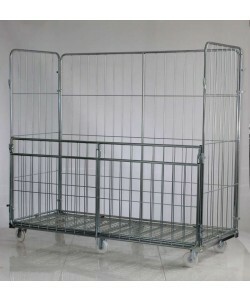 Also available in several different sizes to accommodate larger or smaller loads of goods, the roll cages can be supplied with 3 sides, 4 sides and also in full security versions, with mesh panels. Manufactured in a strong zinc plated steel, the roll containers are very robust and well suited for industrial applications. Commonly used for storage and distribution of products throughout many industries including food manufacturing, textiles, airports, recycling, imports and exports, general industry and many more, the roll cages are all designed to save on space when they are not in use. 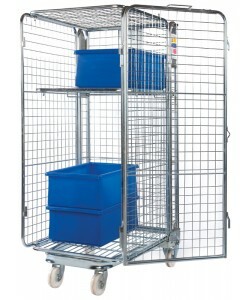 Demountable roll cages break down easily to reduce the space required to store them, and nestable roll containers fold in on themselves and nest on top of one another. Ideal for general distribution applications within general industry, removals and transportation, the NRC3 and NRC4 three and four sided roll cages are nestable and help to save on space, essential when storage space is at a premium. Where larger, bulkier goods are being handled, we offer a jumbo sized nestable roll cage, the NRC/J that can help transport huge items safely and securely, perfect for the automotive industry for example. 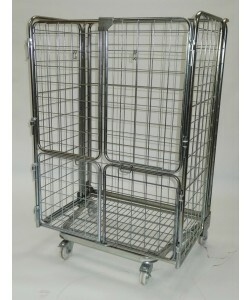 Commonly used within airports and the retail industry, our full security nestable roll cages provide an ideal means for distributing and transporting goods of value as they incorporate small mesh sides and roof, allowing clear visibility of contents but helping to prevent theft. The demountable range of roll containers is available in three different models, small, medium and jumbo, and each of these can be supplied with 3 or 4 sides. The DRCS3 and DRCS4 are ideal for general storage and distribution applications, providing a space saving solution that is easily handled. Our DRCM3 and DRCM4 roll cages are commonly used throughout general manufacturing, food production, textiles and clothing manufacturing industries. Lastly, providing a huge solution for transporting goods, the jumbo demountable roll containers have a large capacity for collection and handling purposes. 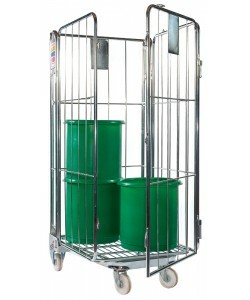 Perfect for distribution and transport applications, the roll containers are easy to handle and manoeuvre. 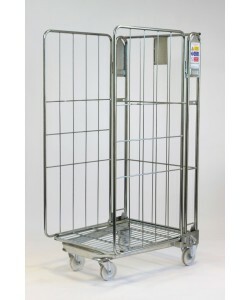 Available with various numbers of sides, the roll cages can be modified to meet your requirements, adding internal shelves, personal identification plates, drop down gates and much more.